Purification of multiple myeloma cells by CD138+ positive selection enhances the sensitivity of FISH analysis by increasing the proportion of malignant cells in the analyte. Multiple Myeloma is a form of cancer caused by B cell neoplasia that results in dysregulated production and clonal expansion of malignant plasma cells (cells that express CD138 (Syndecan-1) and are involved in the production of antibodies during an immune response)1. The disease is characterized by excessive numbers of abnormal plasma cells in the bone marrow and overproduction of both intact monoclonal immunoglobulins and free monoclonal kappa and lambda immunoglobulin light chains. Accordingly, molecular cytogenetics techniques such as fluorescence in situ hybridization (FISH) have become more important tools in the characterization of multiple myeloma. FISH is a cytogenetic technique that is used to detect and localize the presence or absence of specific DNA sequences on chromosomes. It employs nucleic probes - fluorophore conjugates which hybridize to target chromosomal DNA permitting visualization of the chromosome structure. FISH is a sensitive technique that can detect numerous chromosomal aberrations including submicroscopic deletions. It is currently the most effective technique for identifying genomic aberrations in multiple myeloma. FISH analysis can be performed on cells in interphase (iFISH) circumventing the difficulty of slow plasma cell proliferation that hinders conventional cytogenetics. The majority of mitotic cells in myeloma samples are non-malignant, making it necessary to analyze a large number of cells in order to identify abnormal clones. Samples in which less than 5% of the total cells are plasma cells are difficult to reliably characterize due to the paucity and fragility of these cells. However, the CD138 antigen is present on all plasma cells (both normal and malignant) but not on mature B cells, making it a suitable selection marker for the isolation of multiple myeloma cells. Enrichment of plasma cells by CD138 positive selection can therefore enhance the sensitivity of downstream FISH analysis4. If starting with whole bone marrow or whole blood samples, use EasySep™ Human Whole Blood and Bone Marrow CD138 Positive Selection Kit II (Catalog # 17887). EasySep™ is a powerful immunomagnetic cell separation platform that combines the specificity of monoclonal antibodies with the simplicity of a column-free magnetic system for the isolation of highly purified cells. EasySep™ isolation of multiple myeloma cells can be fully automated with RoboSep™ for increased time-savings and minimized sample handling. Alternatively, if starting with bone marrow or peripheral blood mononuclear cells (PBMC) samples that have been prepared by Lymphoprep™ density separation (Catalog #07801), use the EasySep™ Human CD138 Positive Selection Kit (Catalog #18357). This technical bulletin provides complete protocols for the isolation of multiple myeloma cells from whole bone marrow, whole blood, polymorphonuclear cells (PMNC), or PBMC using EasySep™ or RoboSep™ and subsequent preparation of isolated cells for FISH analysis. For further information, please contact techsupport@stemcell.com. *Note: The EasySep™ Red Blood Cell Lysis Buffer is supplied as a 10X concentrate in the kit. Prepare 1X lysis buffer at least 1 hour before use by adding 1 part 10X lysis buffer to 9 parts distilled or Type 1 water. Mix gently and completely before use. Using EasySep™ bone marrow aspirate or PBMC are labeled with a Tetrameric Antibody Complex (TAC) against CD138+ (Syndecan-1) cells (Figure 1) and dextran-coated magnetic particles. Labeled cells are separated using an EasySep™ magnet without the use of columns. Multiple myeloma cells remain in the tube while unwanted cells are poured off. The sample tube containing the desired multiple myeloma cells is removed from the magnet and the cells are recovered by resuspending them in fresh medium. The EasySep™ magnetic particles do not interfere with downstream applications. For more information, visit www.stemcell.com to download the Product Information Sheet. Samples should be processed within 24 hours after collection for optimal cell separation results. However, CD138+ cells can still be isolated up to 4 days post draw with around 75% purity. Multiple myeloma cell isolation can also be fully automated using RoboSep™-S (Catalog #21000) and RoboSep™-16 (Catalog #23000) instruments. The instruments perform all cell labeling and separation steps. A study done to evaluate RoboSep™ for the isolation of CD138+ cells found that the instrument reliably sorted plasma cells even when found in low frequencies (<2%).5 In addition, cells showed better cell preservation and cell morphology leading to a stronger signal intensity and reduced background. Compared to a column-based separation system, samples sorted by RoboSep™ resulted in a higher number of abnormalities detected by FISH. 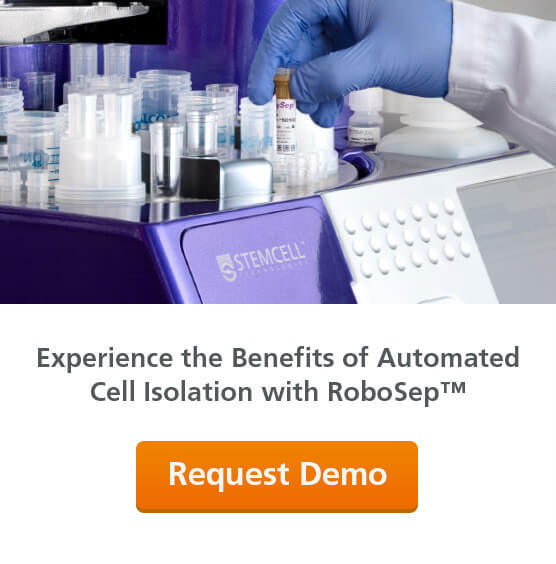 If using RoboSep™ for the isolation of CD138+ cells, select the optimized instrument protocol, which is detailed in the corresponding Product Information Sheet. To assess purity, stain for intracellular κ (Kappa) and λ (Lambda) light chains (e.g. procedure described within Ahmann GJ et al. Cancer Genet Cytogenet 101(1): 7-11, 1998). Plasma cells express either the kappa or lambda light chain. Whole Blood CD138 positive isolation Data from Mar 13, 2006. U266 tumor cells spiked into whole blood. Typical purity range is 89-98% CD138+. *Red blood cells were removed by lysis prior to flow cytometry. Isolated multiple myeloma cells are first concentrated onto a cytospin slide using a cyto-centrifuge system. Visual inspection of the slide under a light microscope is necessary to ensure that the cells are of good morphology and that there is minimal cellular overlap. The slide is then blocked in a saline-sodium citrate solution at 37°C and fixed by treatment with a series of increasing percentage ethanol solutions. In order to allow efficient nucleic probe hybridization, both the cellular chromosomal DNA and the appropriate fluorescent nucleic probes are first denatured. The single stranded probes are then immediately applied to the prepared slide, covered with a cover slip, sealed with rubber cement and incubated in a warm humidified chamber overnight. After incubation, the cover slip and rubber cement are removed and the slide is briefly heated and washed in saline-sodium citrate buffer solution. The slide is then rinsed with a mild non-ionic detergent solution before drying and staining with DAPI1 (to visualise nucleic chromatin.) The slide is now ready for FISH analysis using a highquality dual pass fluorescence microscope. F. Yao-Shan; Methods in Microbiology. Vol 204. Molecular Cytogenetics. Protocols and Applications. RoboSep™ instruments offer true walk-away automation of immunomagnetic cell separation by performing all EasySep™ cell labeling and magnetic separation steps. Set-up is simple: just load your samples and reagents and return to separated cells. Shetty S et al. (2012) Int J Hematol 95(3): 274–81.